The subway is a fast, affordable and comfortable way to get around cities. Read these tips for riding Subway and you'll be traveling around like local people in no time, wherever you go. These tips will also save you a lot of hassles and time. Know before you go. Use a computer or smart phone to check the subway map, and find your departure and arrival stations before you set out. Find out where to transfer if necessary. Download a subway map and city map in your cellphone so that you can have portable maps. Entrances are typically located on street corners with a staircase for descending into the station. There are often signs showing direction to the station. In some cities, there are also maps at the corners of crossing. You can also find metro stations from these maps. A MetroCard offers discounts. More importantly, you can enter metro station faster without lining up to buy tickets with cash. You can even swipe it without taking it out of bag. You can transfer from Bus to Subway, Subway to Bus, Bus to Bus, or between select Subway stations with the card. Note: Make sure you have the appropriate fare on your MetroCard. One of the most helpful things about subway stations is the maps located near or in the station. In addition to having a map of the subway system, there is often a neighborhood map that shows the streets in the area in detail. It's a good idea to check out the map before you leave the subway so that you can find the fastest exit to your destination. Don't worry if you're lost near a subway station, you can always duck in and check out a map to find your way around. Before you get on, make sure you are getting on the right train. Train line signs are presented on the overhead platform signs. The stations which the train is heading for and those in opposite direction are often in different colors. When you are onboard, listen to the broadcaster so that you won't skip your station. Alternatively, you can watch the electronic display for such information. If you don't get a seat, make sure you find a pole or ring to hold and keep balance. It is difficult to keep steady without holding on when the train starts and stops because of the inertia. And no one likes it when you fall on them because you weren't holding on. Bear in mind that even if the subway isn't very crowded when you board, it may get more crowded quickly, so you should not put your bags on seats for too long. It is impolite to take up seats for your bags while ignoring other passengers. Keeping your feet off the seat ensures that other folks have a clean place to sit when they ride the subway. Remember that pregnant women, the elderly, people with disabilities and small children should always be given priority. If you have a seat and see one of these people board the train, stand up and offer your place to them. Let parents sit with their young kids. It's common courtesy. When trains are crowded, it is important to move to the center of the subway car to make room for other riders. Standing by the door even if you move to the side makes it difficult for people getting on and off the train. In case of accidents, stay calm. Sometimes people's fear cause bigger harm than the accident itself. Don't let fear cause chaos. Leave the train in order when necessary. 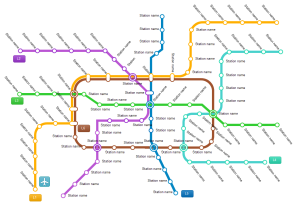 If you need to design a subway map, try an easy and useful tool - Edraw. Check the example drawn by Edraw below. You can take full use of this vector file and make some modifications to make your own subway maps. You can be faster in this way. And you can find more resources from these links: City Subway Map; Subway map. Learn an easy way to draw subway from Design a Subway Map Effortlessly in Minutes.